This is not a sport. Budo taijutsu is not really compatible with the concept of “sport martial arts”. The idea of having the most “points”, the most glamour, the most ego is in complete conflict with what we are attempting to teach. Do not make the error of confusing the lack of competition within the art as a lack of testing of its capabilities. Elements of budo taijutsu have been encorporated into the basic skill set of US Army and Special Forces, Israeli Army, and various US governments agency protocols. Bujinkan classes around the world are populated by police, security and military personnel – they come to us because what we do works. What is Budo Taijutsu About? Our historical roots include six samurai and three ninja traditions. We study how to survive combat in the modern context by looking to the teachings of a bygone era. Everything from unarmed fighting, sword on sword, sticks, ropes, chains, knives, thrown weapons and firearms are considered and included. The ninja perspective is pervasive in the teaching, our attitude, and the movement – it allows us to be subtle, clever and perplexing. Some people have unusual ideas of what modern ninjutsu may involve, usually based upon Hollywood stereotypes and very much out of date and skewed historical information. Consider, we are no more likely to teach assassination and sentry removal as “ninja techniques”, than than any modern Japanese art would teach execution as a reasonable response to insult or performance of seppuku as a set of “samurai skills”. 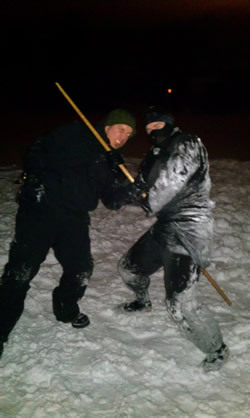 What we have distilled from ninjutsu, is the understanding that our survival is the overall goal, thus physical combat is to avoided as much as possible, and when it is engaged it should be done so in a subtle, powerful and efficient manner. Ideally the enemy shall be defeated before they even realize there has been any conflict, and we will gladly allow our enemy to perceive their own victory if it suits our needs. How about learning how to strike without injuring yourself? What about escapes from holds? How to use a sword, or a knife, or how to defend yourself against them? What about situational awareness? How about learning how to warm up your body for exercise properly so you don't cause permanent damage and make you old before your time? How about learning to use your entire body to provide power over larger and stronger opponents? What about learning what "Self Defense" really is, and how not to end up in jail or worse by making bad decisions. 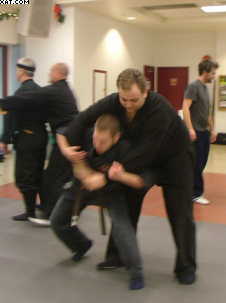 The Bujinkan Dojo is the organization which oversees instruction in Budo Taijutsu. The relationship is somewhat like the nature of a college to a curriculum being studied – think of a medical school and the relationship it has to all the students and faculty there. Budo Taijutsu is the martial art we study. It comes in the form of interpretation and integration of the nine different foundation schools inherited by our soke (grandmaster), Masaaki Hatsumi. Our curriculum is set, at least up to the level of 4th degree black belt, and draws on the fundamental teachings from these schools. The tenchijin no maki (book of heaven, earth, and man) was prescribed by Hatsumi sensei as the syllabus for instruction to blackbelt level. Our "ranking system" sometimes puzzles outsiders, but is based on an historical Japanese method. It has nothing to do with modern Judo or Karate ranks. Basically, students (kyu grades) have a green belt, teachers (dan grades) have black belts. Ocassionally, a senior kyu grade student is awarded a brown belt to signify leadership duties within the club. Rank doesn't mean anything at all outside the training halls, its just an acknowledgment by the teacher of the student's dedication and ability. There are nine kyu grades and ten dan grades (with a further subdivision of 5 grades at 10th dan). It takes most people 3 to 5 years to obtain shodan, 1st level black belt. Classes are taught in a relaxed and co-operative manner. Class usually begins with a simple warm-up and stretch to reduce the chance for injury, and we often procede to work up a heavy sweat in exercises with a fairly direct relationship to training. Most classes will involve a period of ukemi training – that is practicing rolls and breakfalls so that you can train safely. Consider this; you may never get involved in an actual fight the rest of your days, but there is a pretty good chance that one day you will fall or trip. If only for this, studying budo taijutsu may save you broken bones or even your life! Exploration and practice of our fundementals such as, basics of striking, grappling, and developing good movement patterns is often the next element of study. Shadow boxing or solo kata repetition is not a large part of Bujinkan methodology. More often, participants work together one-on-one (or two or three-on-one!) to explore the scope of the forms presented by the instructor. There are no weight classes, there is no division between senior and junior when we train. We are all together to share and learn. Most forms are started slowly with the emphasis on correct and safe movement. Speed develops naturally with competence. Point-sparring does not exist for us. This is because a large part of sparring goes toward building ego, to make one feel superior to one's training partners. This does not contribute to self-improvement, and in fact can cause a dangerous over-confidence. 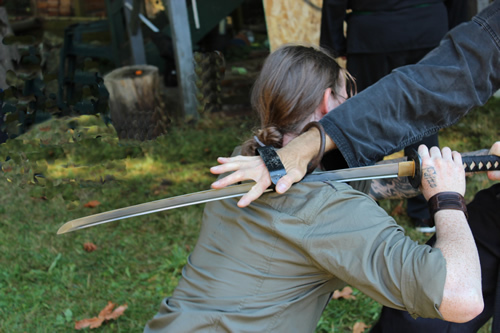 We do utilize sparring formats, but the emphasis is on the student learning to apply specific techniques or approaches to a less structured situation. Our curriculum is set, at least up to the level of 4th degree black belt, and draws on the fundamental teachings from these schools. The tenchijin no maki was established by Hatsumi sensei as the framework for instruction to blackbelt level. 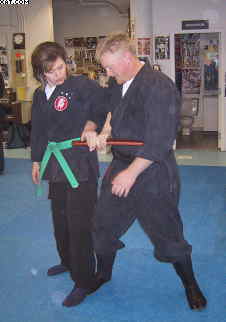 Gradings sometimes occur following a testing period, but commonly happen spontaneously with concensus of the instructors. The reason for this is not because we don't test, but that the students are constantly being tested. All gradings received by students will be official and documented by certificates from hombu dojo in Japan.